Review: This is Ruth Hogan’s third novel, following hot on the heels of The Wisdom of Sally Red Shoes. I was intrigued to see how this story would compare with her last. Although I began by feeling a little lost as to what was going on, I quickly caught up with the story and became completely immersed in the world of its amazing characters. Once again, this book has a wonderful cover, with illustrations echoing parts of the story within. This is basically a tale about one girl and her mother, their relationship and what great sacrifices people can make through deep love of another. It is told in the words of the girl, Tilly or Tilda, first as a 7-year-old and then as a grown up almost 40 years later, after the death of her mother, Grace. At the start of the novel, we learn that Tilly’s father, who she loves dearly, has gone away and has subsequently died. She is heartbroken and struggles to exist with her alcoholic and mentally disturbed mother, whose actions often puzzle her. 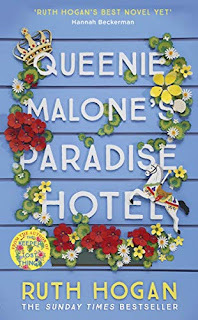 Eventually, they leave home and go to live in Queenie Malone’s Paradise Hotel, where life for Tilly improves as she meets lots of interesting people and experiences the excitement of life in Brighton. Her happy life is shattered when her mother suddenly sends her away to boarding school. It is only later, when her mother dies and she discovers her mother’s diaries that Tilda begins to realise the implications of her mother’s actions over the years. This is a wonderful story, with a surprise around every corner. Just when I thought I had it all straight in my mind, another revelation would come along. There were some very sad bits to the story, but also a lot of humour as well. Some of the characters, including Queenie and the staff at the hotel, are really amusing, but what had me laughing most of all was the girl Tilly’s observations on what is going on around her in the adult world and her habit of picking up incorrect words or names. Most definitely a worthy successor to Ruth Hogan’s previous novels.